Deborah Crombie & Charles Todd at The Poisoned Pen! 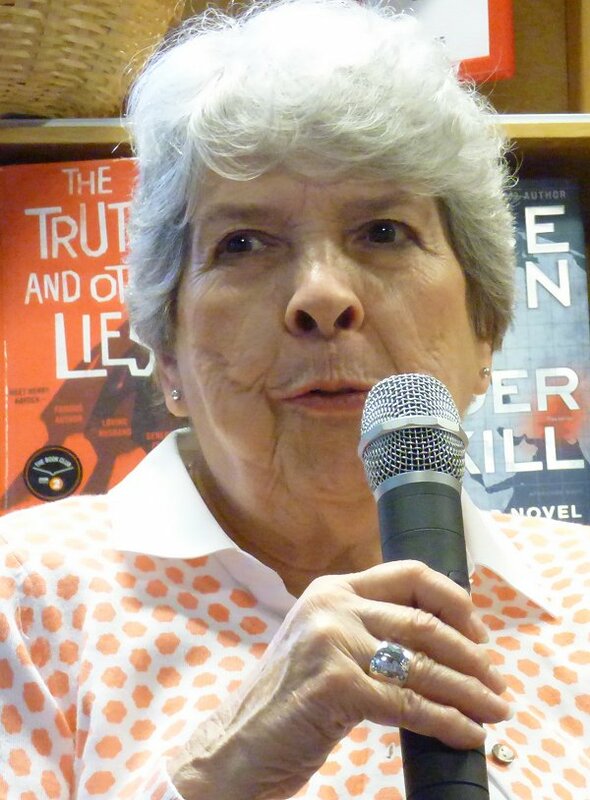 When it was time to hop in the Jeep and head on over to The Poisoned Pen, I had to wonder what the turnout would be like for Deborah Crombie and the mother-son writing team of Charles Todd. You see, it was raining, and I never know how Phoenicians are going to jump when rain is on the menu. I was thinking that, with such a stellar lineup, most people weren't going to let a little rain keep them away from my favorite bookstore. I was right. It was another event when Poisoned Pen staff members had to keep bringing out more chairs. Many people who only occasionally come to The Poisoned Pen do not realize that the authors are in another room busily signing all the mail order books before the event begins. Sometimes the piles of to-be-signed books are huge, so this means that host Barbara Peters has to chat with us for a few minutes. I never mind because she always has something interesting to say. This time it was what Scottsdale was like in 1950, the year that Barbara moved here. Scottsdale had not been incorporated yet. There were only two paved roads, and you had to take a buckboard from Sky Harbor Airport to the Camelback Inn. Needless to say, Scottsdale and the entire metropolitan area has experienced unbelievable change since then! Barbara had taken the Todds around on a tour of some of the museums in the area, which is when she discovered that Caroline Todd has a penchant for buying jewelry in museum gift shops. 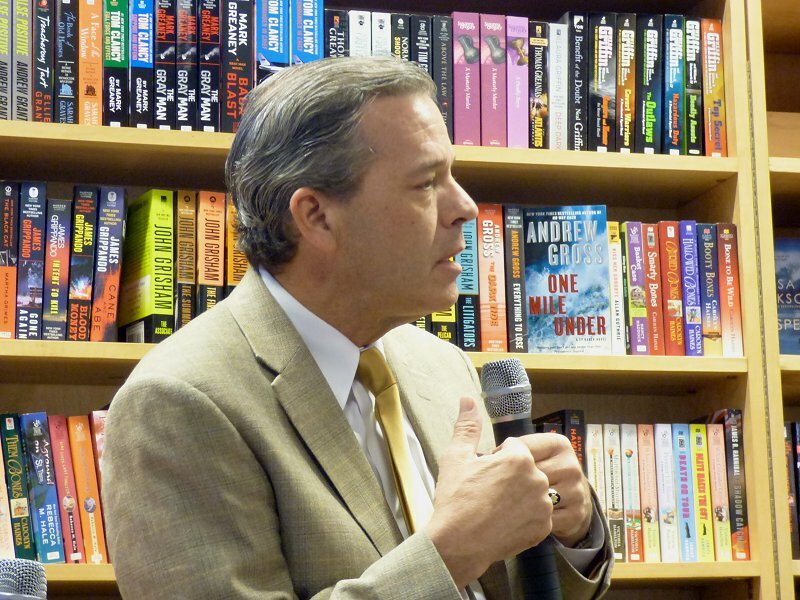 While Peters was talking, I was cognizant of Mark Pryor, who had flown in from Austin, Texas, the day before to interview Ian Rankin ("It was a mob scene, and we sold out of books!") and of Jenn McKinlay who was sitting behind me. She was there for fellow Jungle Red writer Crombie. When the event for Rankin was mentioned, David Todd (yes, David is his real name) said, "I attended an event for Ian Rankin and Val McDermid. That was so much fun!" Talk swiftly moved to books, beginning with the Todds' Racing the Devil, the nineteenth Ian Rutledge mystery. 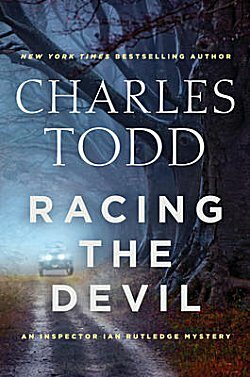 "Racing the Devil has one of the most chilling villains I've ever read!" Peters commented. 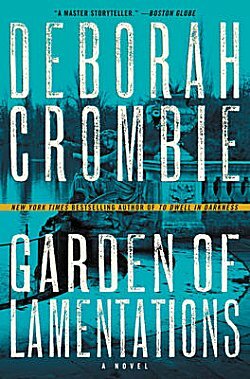 Then it was Crombie's turn to introduce Garden of Lamentations. "It's a locked garden mystery," she said. "How many of you have seen the movie Notting Hill?" Several of us raised our hands. "So you're a bit familiar with the private gardens in London that only residents have access to. I just want you to know that Cornwall Garden does not exist. I walked all over to find the perfect garden in which to set the book, then I decided to create my own and plop it down where some ugly council flats are. "I also want to apologize to all of you," she continued. "I know it's been much longer between books!" (Many heads were nodding agreement in the audience.) "When I was finished, I turned in a 650-page manuscript. My editor told me, 'You do know that this could be two 300-page books?' I did realize this, but I liked the interweaving of the stories and wanted to keep it as one book. "This is the first time that I've written a book with two separate cases that do not mesh, although I do feel that they mesh emotionally." Caroline Todd said, "I received an early copy of this, and I loved it!" We then discovered that Caroline likes to send messages to authors that mark her progress through their books. "She's a mad texter!" Crombie laughed. Back to Racing the Devil, it's November 1920 for Inspector Ian Rutledge. Caroline told us that the timeline of the books has deliberately been taken very slowly because of Rutledge dealing with his problems. ("Shell shock" then would be referred to as PTSD now.) If each book had represented a year in Rutledge's life, the series would've taken him into the 1930s and a very different world. The way the Todds write, he solves a new case every six weeks or so. David told us that it depends upon the case as to Hamish's involvement. "If the case has something to do with the war [World War I], Hamish is involved more," Caroline said. The Todds found themselves on several mountain roads in the south of France that had no guard rails-- including the stretch of road where Princess Grace of Monaco and her daughter had their accidents-- and during one period of travel on these treacherous roads in a heavy mist, Caroline said, "Wouldn't this be a great place for a murder?" This is why part of Racing the Devil takes place in France. This led to David researching automobiles of the period. He and his mother have had readers write and tell them that they've gotten the driving times and the number of times they'd have to stop for petrol wrong. They are very well aware of this without being told. "The books aren't always true to life because all these stops slow the book's momentum to a crawl," Caroline said. A brief and interesting conversation about the early days of the automotive industry ended with Caroline admitting that they had friends in the Rolls Royce club upset with them because they were crashing these classic cars in the book. The Todds have it written into their contract that they do not have to turn in an outline of the next book, just a one-paragraph description--"Some of our best fiction," David said deadpan. He went on to mention a staple of crime fiction, the red herring. "If you don't make red herrings, it's amazing how they appear, and if you don't know how it ends, doesn't that make the book more fun to write?" Caroline thinks not knowing the identity of the killer as the book is being written is a good thing. "If you don't know the killer, then he's just another character in the book, and there are no giveaways in descriptions and the like." She then spoke of their perfect proofreader, her husband the chemical engineer. "He's brilliant with all the little details. Two-thirds of the way through reading the manuscript, he'll say, 'You're not going to be able to finish this.' When he finishes reading the manuscript, he says, 'I don't know how you did it!' I think that if he doesn't know, no one else will." Jenn McKinlay had a question for the Todds: "Do you ever fight?" "All the time!" they replied. 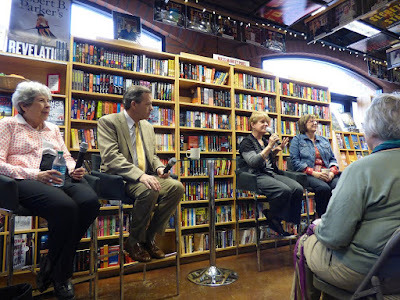 "You did something really fun in this book," Crombie interjected. "We've known all along that Ian Rutledge and Bess Crawford [the main character of the Todds' other series] know someone in common-- Melinda Crawford-- but in this book Rutledge and Melinda actually mention Bess and Bess gives him a piece of information that helps him solve the case!" "But don't expect them [Rutledge and Bess] to get married!" Caroline said quickly. "Our publisher wants Bess and Simon to get married. Bess will decide in her own good time!" 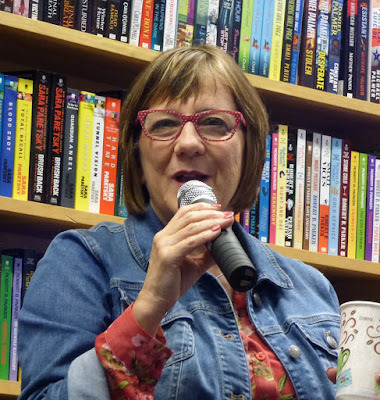 This reminded Peters of a piece she wrote for Left Coast Crime involving Laurie R. King. Peters asked King why her Kate Martinelli character was a lesbian. King replied, "I wanted Kate to be able to work with men with no chance of romance." Crombie knew what the others were talking about. "I never meant Duncan and Gemma to be together." Following this was a brief foray into one of Crombie's book titles, Leave the Grave Green. "I have always-- always-- called it Leave the Grass Green!" Barbara Peters lamented. "That's okay," Crombie replied. "My publisher calls it 'the fertilizer book'!" The reason why I include this little snippet is because I'd had an earlier conversation with someone else in the bookstore who admitted to needing caution when typing the title of Crombie's latest. I was relieved to learn that I'm not the only one whose typing fingers try to leave out the first "t" making the title "Garden of Lamenations" (which makes me itch to find something to use my laminator on). David Todd also enjoyed reading Garden of Lamentations. "Everyone in the book seems to be at cross purposes," Crombie said, to which he remarked, "Gemma is feeling out of the loop, and Duncan can't tell her what's going on." A fan mentioned Melody and Doug, two other characters in Crombie's series. "I love writing about them not getting together!" Crombie laughed. Another fan asked what was next for the Todds. The next Bess Crawford book, A Casualty of War, will be released in September. In August, they're going to Manchester and Hadrian's Wall for research. "Have you ever thought of setting one of your books during the Peace Conference?" Peters asked. Caroline replied, "We looked into it, but there's so much going on that it would be hard to focus on a murder." The Todds have written a short story about Hamish, "The Piper," but it's only available in digital format right now. They're working on getting it in print. (Speaking of differing formats, Peters mentioned that The Poisoned Pen now has the capability to sell audiobooks. Just go to The Poisoned Pen website, scroll down to the bottom of the first page, and the last item on the right hand sidebar has the information you'll need if you're interested.) Talk of audiobooks reminded the Todds that they'd just re-signed their two audiobook readers. What's next for Deborah Crombie? "Duncan and Gemma had three scenes together in this entire book," Crombie said. "This next time, I'm sending the entire family to the country, and they will all work together to solve one crime. I've been fascinated with Melody Talbot's family, so Duncan and Gemma will be going to Melody's parents' country home for Guy Fawkes weekend. It will have something to do with a well-known female chef... and I'll have you know that I am determined not to get into another multi-book storyline!" 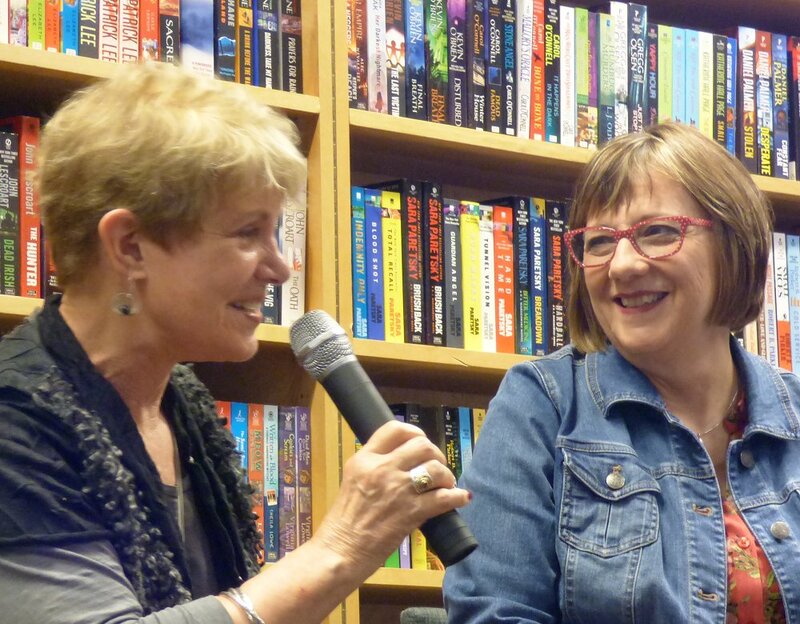 When asked, Deborah admitted that she's "always wanted to set a book in the Cotswolds, but I love London so much that I've never had a problem with ideas for it." "The landscape is a character in both your books," Peters said, looking at Crombie and the Todds. 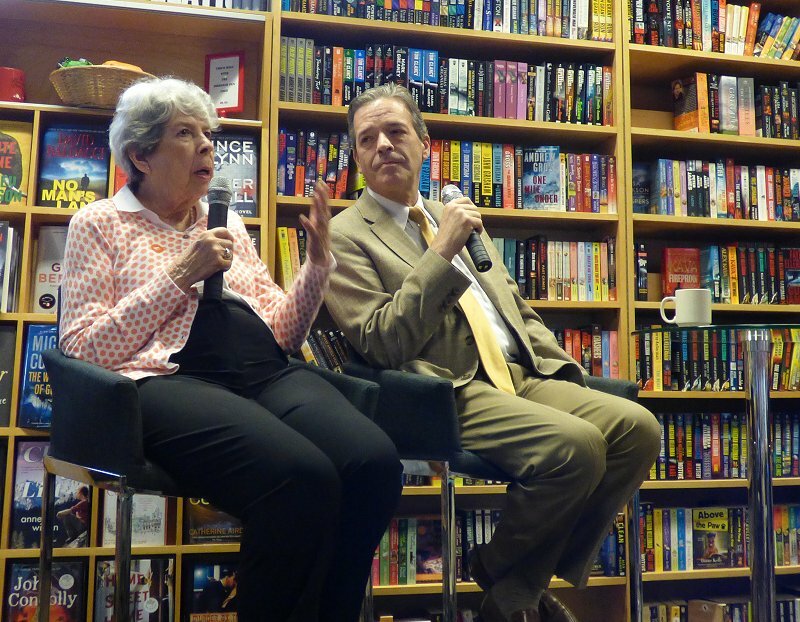 "HarperCollins hired topographers to do maps showing where our books are set,"David said. "Just go to Charles Todd Map." 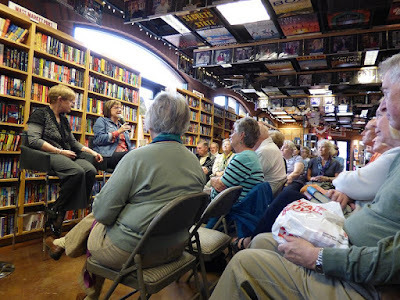 Another fan wanted to know if the Todds had ever thought about setting one of their books in Hay-on-Wye, the UK's "booktown." "No, I'd spend too much time in the bookshops!" Caroline replied. "We won't set one in Eton, either," said David. "I'd spend too much time in the antique shops!" When asked why they all set their books in England, the answer was simple: all three are Anglophiles. "I was married to a Scot for several years and lived in the UK. Besides... if Lee Child can write about America, we can bloody well write about England!" Crombie exclaimed to an appreciative audience. Another fan question concerned Wren, one of Crombie's characters. "Which came first, the character of Wren, or your granddaughter, Wren?" "The character," Crombie said. "I've dedicated the book to my granddaughter." Another wanted to know about how the Todds' writing partnership works. "Very interestingly," David said. "We started writing when I was living in North Carolina and my mother was in Delaware. We work scene by scene. Thank God for email and the phone companies dropping long distance charges! We work each scene until we're comfortable with it. Now I can't tell which sentence is mine and which is hers." "And no, David does not write all the war scenes," Caroline stated. "He's had to learn his fair share about interior design and clothing!" What are these writers reading and recommending now? Deborah Crombie: "Elly Griffiths' and Terry Shames' latest books, and The Devil in the Kitchen, which is a memoir by the first British chef rock star." David Todd: "Swiss Vendetta and War of Nerves, which is about nerve gas." Caroline Todd: "Lori Rader-Day's The Day I Died. I really enjoy Anne Cleeland's books, and Ragnar Jonasson's mysteries set in Iceland." If you'd like to watch this event in its entirety, go to The Poisoned Pen's Livestream channel and enjoy! A small percentage of a very appreciative audience! Oh, you always get to see the best authors, Cathy! All of those series are very well-written, and how fascinating to learn how the Todds work as a pair. Lucky you to have been there to hear it! Yes, I am *very* lucky! Yes, we folks in the audience doublechecked!